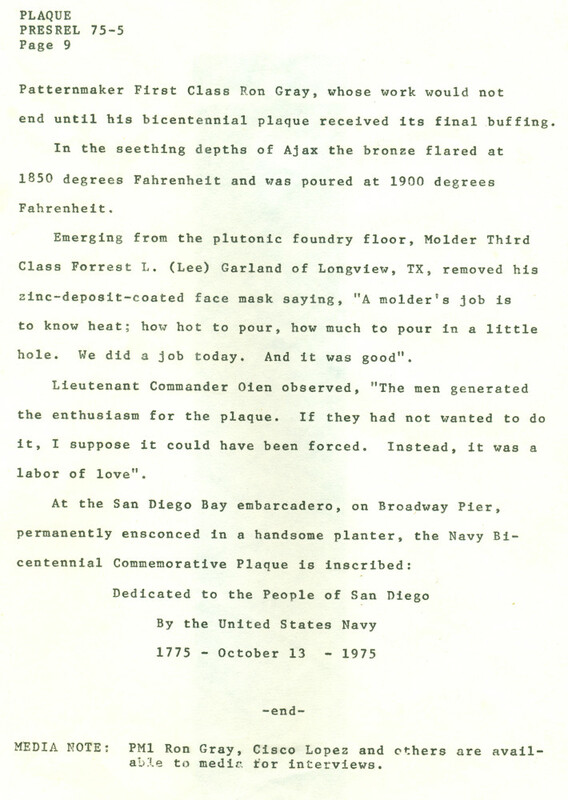 Creating a plaque: Navy history in San Diego revealed! – Cool San Diego Sights! Creating a plaque: Navy history in San Diego revealed! 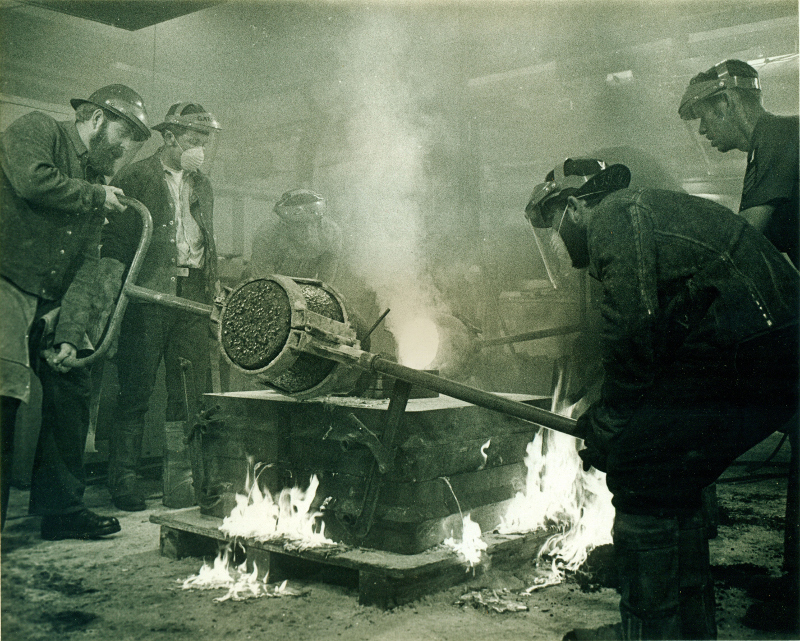 Molten bronze is poured in the foundry of the USS Ajax. Historical photograph of the Navy Bicentennial Commemorative Plaque being created. Photo credit: United States Navy. A few days ago I received new information about an important bronze plaque, which was created in 1975 to commemorate the United States Navy’s 200 year anniversary. 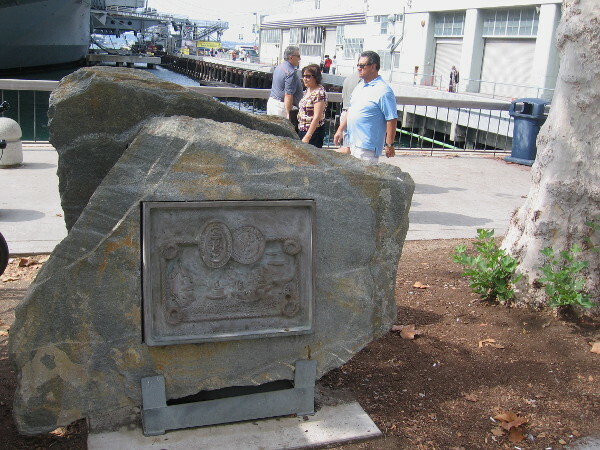 The historic Navy Bicentennial Commemorative Plaque stands today on San Diego’s Embarcadero, on the Greatest Generation Walk next to the USS Midway Museum. Thousands of people breeze past it every day. People pass the Navy Bicentennial Commemorative Plaque, displayed on the Greatest Generation Walk near the USS Midway Museum. Photo taken October 17, 2015. Photo of Navy 200 year commemoration plaque courtesy the Port of San Diego. When I first saw the old plaque, I could find absolutely nothing about it on the internet. So I originally posted this blog. As new information trickled in–sometimes out of the blue–I posted this and this. I was recently contacted by one of the plaque’s creators. He has provided detailed information about its history, including three amazing photographs and nine scans of a typed News Release from 40 years ago. The text of the News Release does not appear online, so I carefully transcribed the words. That way a very important bit of San Diego and Navy history won’t be lost. If you know more about this plaque and would like to add some information, please leave a comment below. If you’d like to contact me, but don’t want to have your comment published, then please tell me that and I’ll email you. Navy Commemorative Plaque News Release. Navy Bicentennial, October 3-13, 1975. Page 1. San Diego . . . . . 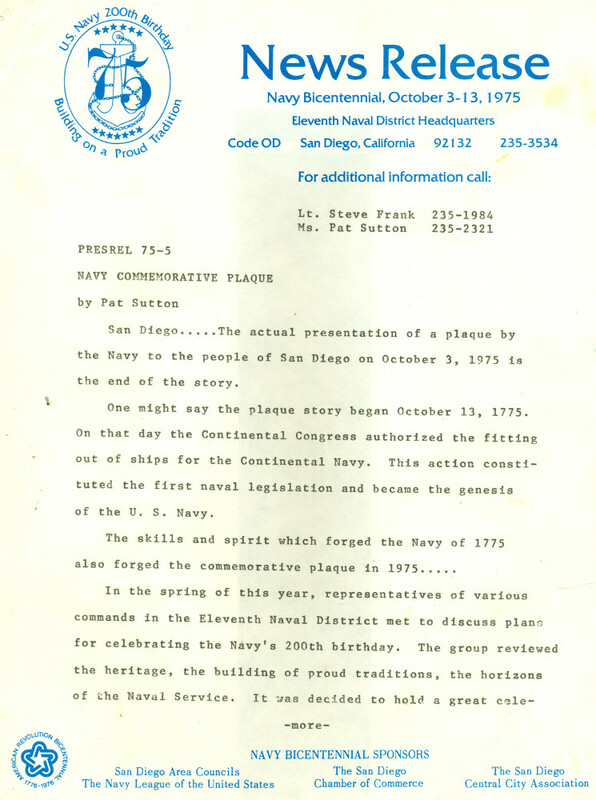 The actual presentation of a plaque by the Navy to the people of San Diego on October 3, 1975 is the end of the story. One might say the plaque story began October 13, 1775. On that day the Continental Congress authorized the fitting out of ships for the Continental Navy. This action constituted the first naval legislation and became the genesis of the U. S. Navy. The skills and spirit which forged the Navy of 1775 also forged the commemorative plaque in 1975 . . . . .
Navy Commemorative Plaque News Release. Navy Bicentennial, October 3-13, 1975. 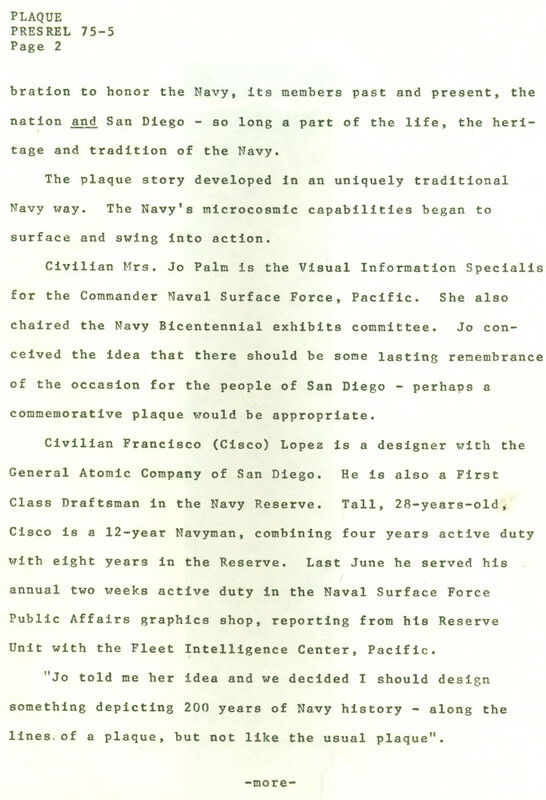 Page 2.
to honor the Navy, its members past and present, the nation and San Diego – so long a part of the life, the heritage and tradition of the Navy. The plaque story developed in an uniquely traditional Navy way. The Navy’s microcosmic capabilities began to surface and swing into action. Civilian Mrs. Jo Palm is the Visual Information Specialist for the Commander Naval Surface Force, Pacific. She also chaired the Navy Bicentennial exhibits committee. Jo conceived the idea that there should be some lasting remembrance of the occasion for the people of San Diego – perhaps a commemorative plaque would be appropriate. Civilian Francisco (Cisco) Lopez is a designer with the General Atomic Company of San Diego. He is also a First Class Draftsman in the Navy Reserve. Tall, 28-years-old, Cisco is a 12-year Navyman, combining four years active duty with eight years in the Reserve. Last June he served his annual two weeks active duty in the Naval Surface Force Public Affairs graphics shop, reporting from his Reserve Unit with the Fleet Intelligence Center, Pacific. Navy Commemorative Plaque News Release. Navy Bicentennial, October 3-13, 1975. Page 3. Cisco was raised in San Francisco and has lived in San Diego the past five years. He graduated from San Francisco State and hopes eventually to be a research historian or teacher. “I have almost a passion for history. I’m taking a month off work in June ’76, I’ll be in Philadelphia on the Fourth of July. As an armchair military historian I really relished the opportunity to be a part of today’s history by designing a representation of our Navy over a span of 200 years”. For a fleet repair ship like Ajax, “can” is a reality because she is designed for heavy duty hull repair; to provide a full range of repair services to Navy units in remote areas. 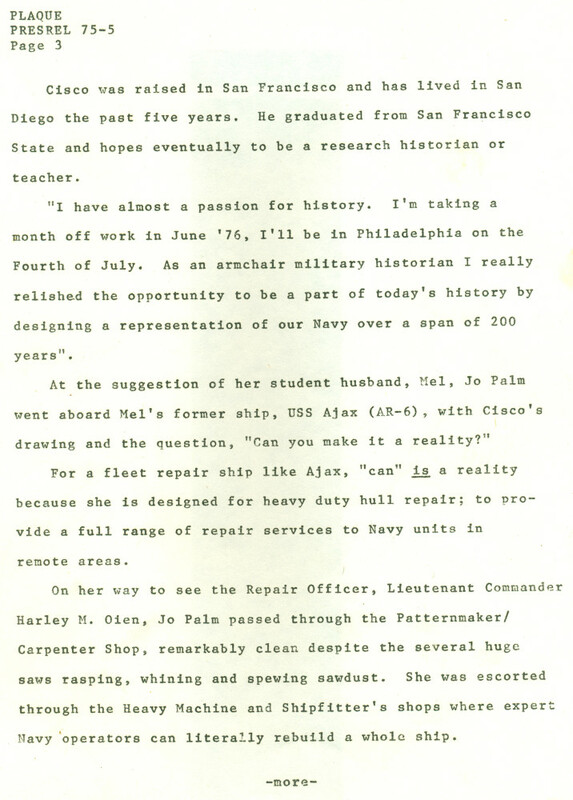 On her way to see the Repair Officer, Lieutenant Commander Harley M. Oien, Jo Palm passed through the Patternmaker/Carpenter Shop, remarkably clean despite the several huge saws rasping, whining and spewing sawdust. She was escorted through the Heavy Machine and Shipfitter’s shops where expert Navy operators can literally rebuild a whole ship. Navy Commemorative Plaque News Release. Navy Bicentennial, October 3-13, 1975. Page 4. Twelve-year Navy veteran, Chief Molder Marvin E. (Tex) Feasell of Baytown, TX, is in charge of the Ajax foundry. 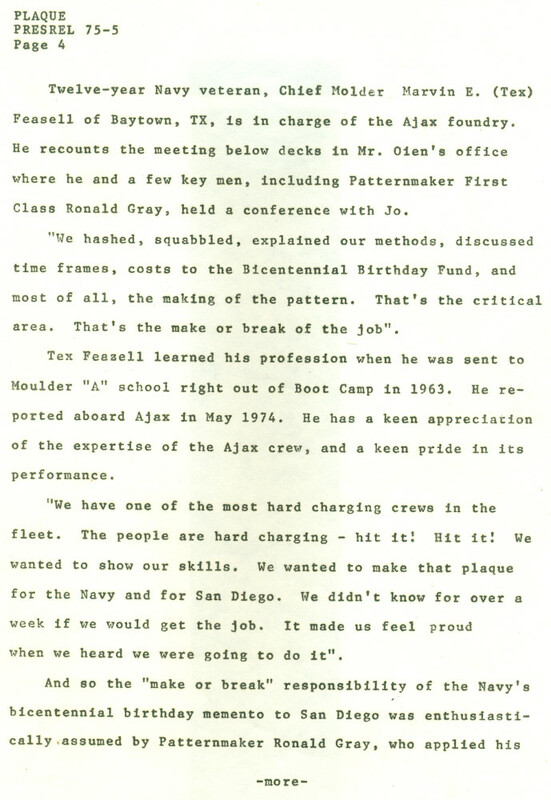 He recounts the meeting below decks in Mr. Oien’s office where he and a few key men, including Patternmaker First Class Ronald Gray, held a conference with Jo. “We hashed, squabbled, explained our methods, discussed time frames, costs to the Bicentennial Birthday Fund, and most of all, the making of the pattern. That’s the critical area. That’s the make or break of the job”. Tex Feazell learned his profession when he was sent to the Moulder “A” school right out of Boot Camp in 1963. He reported aboard Ajax in May 1974. He has a keen appreciation of the expertise of the Ajax crew, and a keen pride in its performance. “We have one of the most hard charging crews in the fleet. The people are hard charging – hit it! Hit it! We wanted to show our skills. We wanted to make that plaque for the Navy and for San Diego. We didn’t know for over a week if we would get the job. It made us feel proud when we heard we were going to do it”. Navy Commemorative Plaque News Release. Navy Bicentennial, October 3-13, 1975. Page 5. Navy-learned skills to transform from drawing to working pattern the impression of 200 years of the United States Navy. Ron has not always served in the time honored rate of Patternmaker. He joined the Navy shortly after he graduated from high school in Olympia, WA, and served his first hitch as a Commissaryman. 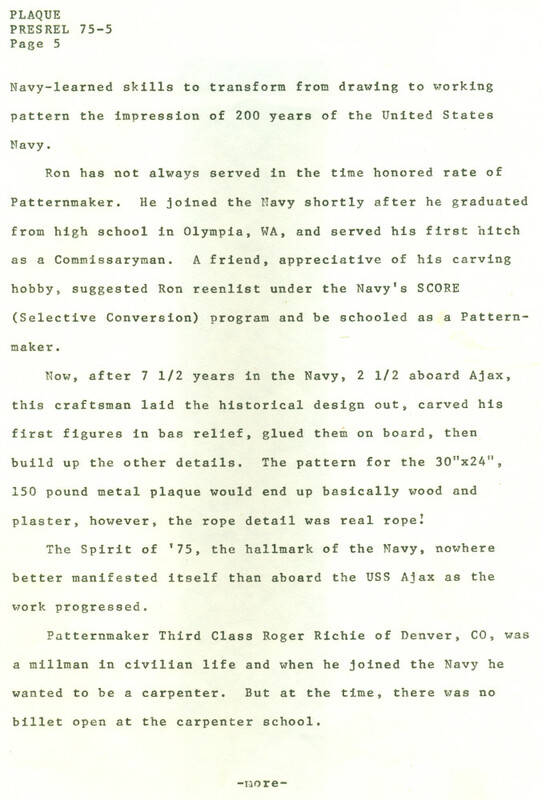 A friend, appreciative of his carving hobby, suggested Ron reenlist under the Navy’s SCORE (Selective Conversion) program and be schooled as a Patternmaker. Now, after 7 1/2 years in the Navy, 2 1/2 aboard Ajax, this craftsman laid the historical design out, carved his first figures in bas relief, glued them on board, then build up the other details. The pattern for the 30″ x 24″, 150 pound metal plaque would end up basically wood and plaster, however, the rope detail was real rope! The Spirit of ’75, the hallmark of the Navy, nowhere better manifested itself than aboard the USS Ajax as the work progressed. Patternmaker Third Class Roger Richie of Denver, CO, was a millman in civilian life and when he joined the Navy he wanted to be a carpenter. But at the time, there was no billet open at the carpenter school. Navy Commemorative Plaque News Release. Navy Bicentennial, October 3-13, 1975. Page 6. “Now I think I got lucky, because I was sent to Patternmaker’s School. There’s not too many of us in the Navy, or in the country, for that matter. So by what you might call a ‘freak accident’ I was here to help Ron on the plaque. There’s pride in this job”. The Ajax Dental Department loaned Ron Gray tools for working on the intricate wax carvings, and a dental drill for final sanding. The ship’s Dental Officer, Commander Roger E. Bisson of Helena, MT, enjoys woodworking and asked to carve the plaque’s Navy aircraft with his precision instruments. “We all want to contribute. Gray is so willing to share the glory with the team, even though he has done most of the work”, Bisson said. 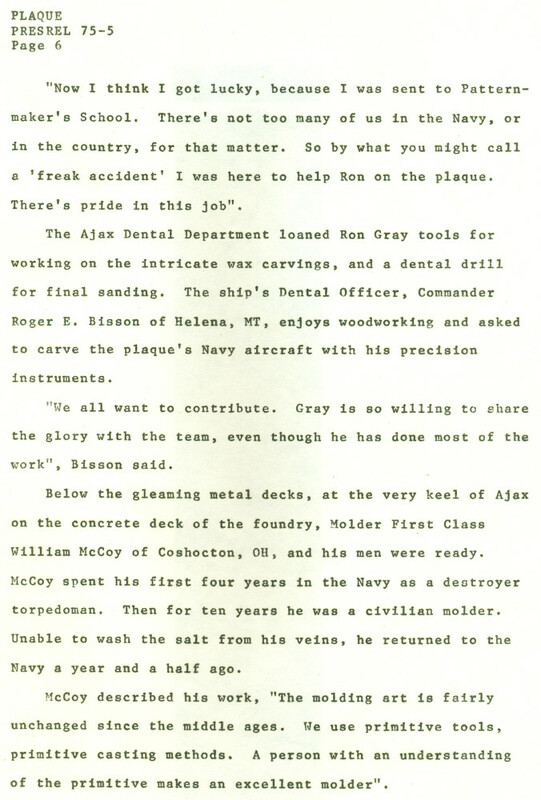 Below the gleaming metal decks, at the very keel of Ajax on the concrete deck of the foundry, Molder First Class William McCoy of Coshocton, OH, and his men were ready. McCoy spent his first four years in the Navy as a destroyer torpedoman. Then for ten years he was a civilian molder. Unable to wash the salt from his veins, he returned to the Navy a year and a half ago. McCoy described his work, “The molding art is fairly unchanged since the middle ages. We use primitive tools, primitive casting methods. A person with an understanding of the primitive makes an excellent molder”. Navy Commemorative Plaque News Release. Navy Bicentennial, October 3-13, 1975. Page 7. Then he turned to his bicentennial commemorative plaque assignment, “We’re looking forward to this job. The foundrymen will tussle with 700 to 800 pounds of sand and probably 150 pounds of molten metal. That’s a big pour”. In providing the material for that “big pour”, the Navyman’s natural penchant for building on a proud tradition swung into action again. Commander William D. Collins, Public Affairs Officer for the Commander Naval Air Force, Pacific Fleet, remembered the legendary aircraft carrier USS Bunker Hill (CV-17). A World War II combatant, Bunker Hill, was nicknamed “Holiday Express” because from November 11, 1943 to May 11, 1945, when she sustained crippling bomb and Kamikaze hits, she had conducted ten major strikes on holidays. During this brief period she had run up a combat record of 430 enemy planes destroyed in the air; 230 on the ground; 146,803 tons of enemy shipping sent to the bottom and 20 enemy planes shot down by her antiaircraft batteries. In 1947 Bunker Hill was decommissioned. In 1965, 22 years after her commissioning, the old warrior was fitted out as a research facility for the Naval Electronics Laboratory Center, San Diego. She became a San Diego landmark moored in the bay off North Island Naval Air Station as she served as a floating laboratory for seven years. Navy Commemorative Plaque News Release. Navy Bicentennial, October 3-13, 1975. Page 8. 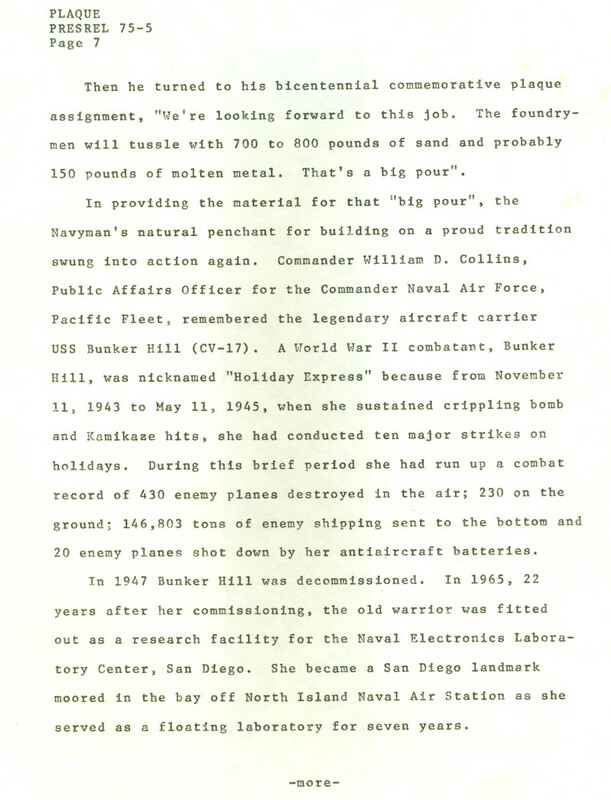 “The Bunker Hill was stripped of her brass and bronze fittings prior to her scraping in late 1972”, Commander Collins reported at a Bicentennial Committee meeting, “this was molded into ingots. Some of the ingots still remain and are stored at the Naval Station in Honolulu. We would be honored to have Bunker Hill permanently a part of San Diego. The Pacific Naval Air Force will provide her brass and bronze for the plaque”. In August Jo Palm called Cisco Lopez with the news that the plaque was to become a reality. Cisco told Jo of an uniquely Navy coincidence. “For my 1975 active duty tour I was stationed on Ajax! I designed ducting for ventilation of a spray booth. Great crew! I never expected to work with them again”. 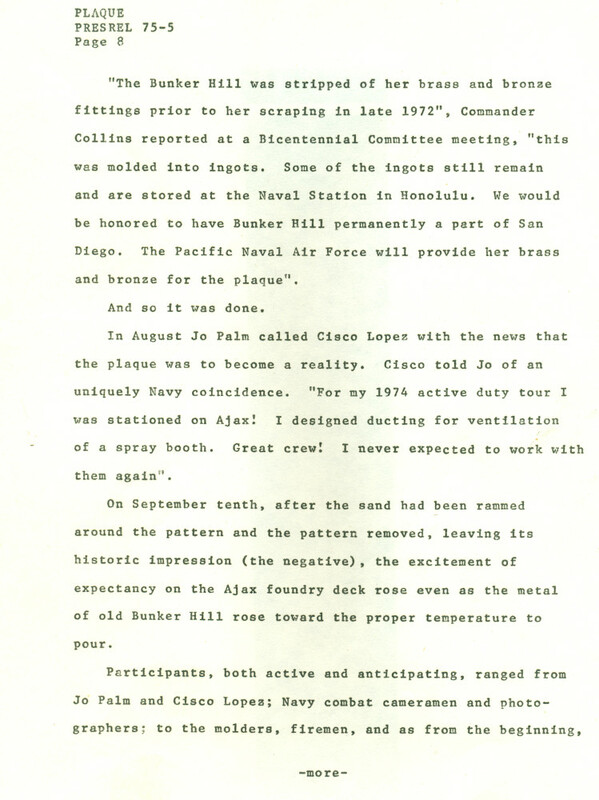 On September tenth, after the sand had been rammed around the pattern and the pattern removed, leaving its historic impression (the negative), the excitement of expectancy on the Ajax foundry deck rose even as the metal of old Bunker Hill rose toward the proper temperature to pour. Navy Commemorative Plaque News Release. Navy Bicentennial, October 3-13, 1975. Page 9. Patternmaker First Class Ron Gray, whose work would not end until his bicentennial plaque received its final buffing. In the seething depths of Ajax the bronze flared at 1850 degrees Fahrenheit and was poured at 1900 degrees Fahrenheit. Lieutenant Commander Oien observed, “The men generated the enthusiasm for the plaque. If they had not wanted to do it, I suppose it could have been forced. Instead, it was a labor of love”. 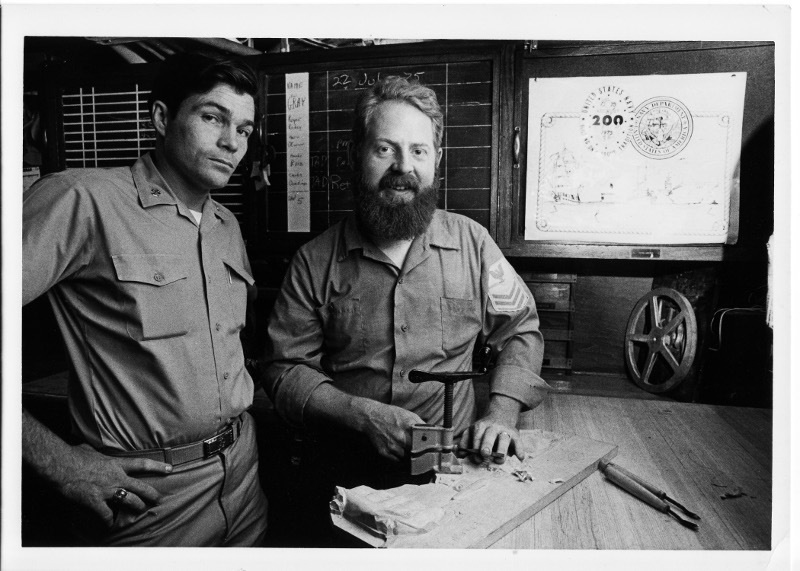 Tex Feazell and Ron Gray with the first wood carving and the original drawing. Photo credit: United States Navy. 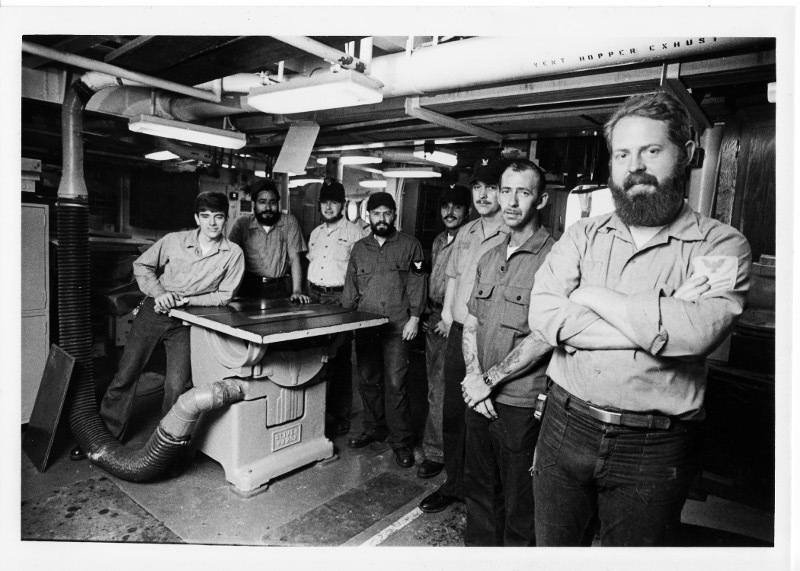 Patternmaker Kevin O’Connor, Molder Jessie Lopez, Molder Lee Garland, Patternmaker Roger Richie, two unidentified Molders, Bill McCoy and Ron Gray. Photo credit: United States Navy. Follow this blog for more amazing, unexpected discoveries! Join me on Facebook or Twitter. Whoa!! You must have been in awe to receive all this! After all the investigation – this is the result – true, honest to goodness – HISTORY!! Congratulations, Richard you deserve to this post – you sure worked for it!!! You do both The U.S. Navy and The city of San Diego proud!!!! Yeah. The whole thing has been pretty incredible. All I ever really did was ask readers about a mysterious plaque. I’m as amazed as anybody at the result. And I’m grateful that history can live on. Very Cool – I’ve stopped and stared at this plaque a number of time, even have pictures of it someplace always wondered what it history was. Thanks! What a great story! Ronald Gray is my dad. What a special piece of history. Thanks for the discovery. Wow! How cool is that? I’m glad the people who were involved have a chance to enjoy this! It’s something to definitely be proud about! I remember your Dad. I was there when he and Roger Richie were making the matchboard for the plaque. I worked in the Dive Locker next to the Pattern Shop and your Dad let me use the shop tool to make furniture after hours. Still use the kitchen table I made on Ajax 40 years ago. Hi I worked for your dad on this plaque. I’m kevin oconnor. I enjoyed working for your dad, many great memories. He enjoyed carving a lot. Richard- This truly is a monument that deserves a little better recognition from the Port district. I checked, and even after all this it wasn’t even listed. Those otherwise forgotten Sailors on AJAX back in 75 and those who everyday help San Diego remember the Navy keep citizens like me proud of their service to our country. In an email I offered to send the Port of San Diego hi-res files of those photos for their archives, but I have yet to receive a response. 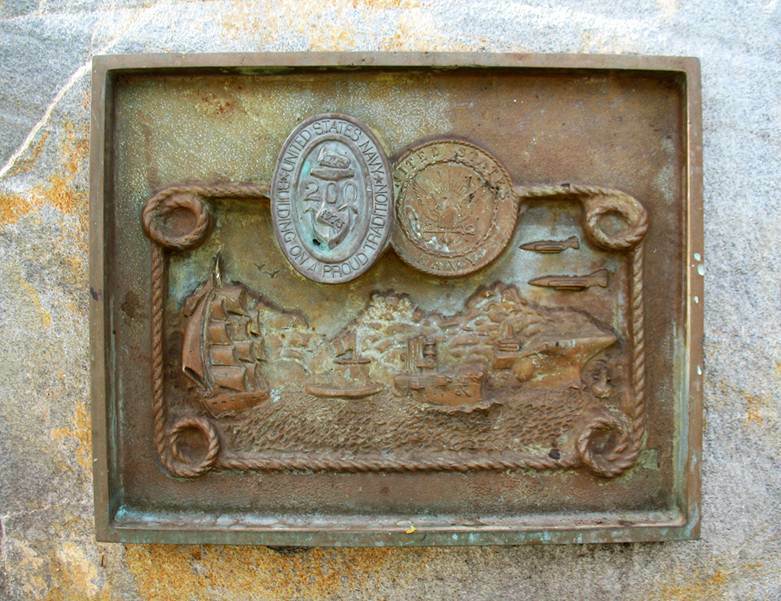 Pingback: Navy Bicentennial Commemorative Plaque–cleaned! – Cool San Diego Sights! Someday I’d like to go there and look it up. Of all my commands in 20 years the “Jax” was my favorite. I still live in San Diego county retired from active duty since ‘94. Pingback: Marine Corps Recruit Depot brass plaque at City Hall. – Cool San Diego Sights! Previous Previous post: A beautiful, hidden fountain forgotten by time. Next Next post: Cool people in San Diego donate to help kids!